A new forecast for Dallas-Fort Worth commercial real estate predicts continued strong demand for buildings during the next few years. CBRE Group made gave its annual property market outlook Wednesday night at the Ritz-Carlton Hotel in Uptown. The bottom line: Expect real estate demand in the D-FW to continue to grow along with jobs and population. 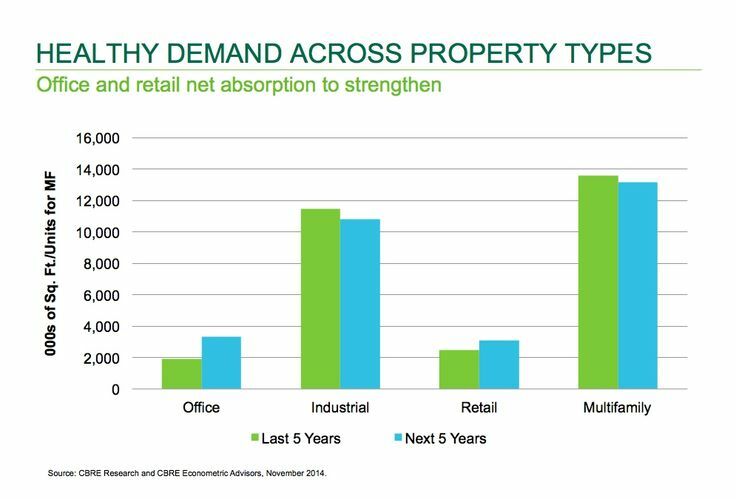 “The local economy is expected to support healthy demand across property sectors,” Sara Rutledge, CBRE’s director of research and analysis said. “Industrial will likely moderate slightly given limited availability until new construction comes online. “Multifamily is also expected to moderate given that it is later in the cycle,” she said. CBRE’s research shows that since 2010 106 companies – the highest number for any Texas office market – expanded or relocated into space in the D-FW area. Most of the leases were by companies in insurance (27%), financial services (15%) and technology (13%). Insurance is at the top of that list mainly because of State Farm’s new 1.3 million-square-foot office complex being built in Richardson.